Serving good food at a great value is something Dawn Glover and her team of corporate dining service professions take great pride in. It's what they do. And now, so is handing out free food, coats and blankets to the homeless at Christmas. It's just the kind of community involvement - that "something extra" - Southern Foodservice Management encourages in its employees. According to Dawn, a Southern Project Manager at Volkswagon's plant in Chattanooga, they know how lucky they are "to have jobs and work for a great company." And they wanted to do something for those who aren't so fortunate. And that's how Operation PB&J was born. It just made sense: experts in office catering catering to the needs of others in the community. They started by collecting donations from individuals and local businesses: forty loaves of bread from Flowers Bakery; two cases of cream pies (You thought I was going to say fishes, didn't you?) from Little Debbie; fifty coats, ten blankets and a ridiculous number of Ziploc storage bags. Oh, and a lot of peanut butter and jelly. A whole lot of peanut butter and jelly. For those of you keeping track at home, that's like a thousand pieces of bread. A thousand! Plus P, B and J. All that was left was to take the community involvement into the community. Which is just what they did the very next day, when they trekked into downtown Chattanooga and gave it all away. By all accounts, the event was a fantastic success. They nailed it. So much charity and good will, so much appreciation, and so many happily-jellied faces. And if you thought that was the end of the story, you'd be mistaken. Operation PB&J isn't going anywhere. Except to their next target: a brand new homeless shelter for families. Word is, they're in need of lots of soap, toothbrushes, towels and blankets. 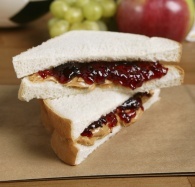 Oh, and a whole lot of peanut butter and jelly.